Sisko and Co., chased by Jem’Hadar ships after the events of the previous episode, crash land on an uncharted planet with little hope of rescue. Meanwhile, Kira and Odo are adjusting — too well — to life aboard occupied DS9. After a vedek publicly hangs herself to protest the Dominion sending Vorta facilitators to Bajor, Kira decides to form a new resistance. Back on the planet, Sisko and Co. encounter a group of Jem’Hadar led by an injured Vorta, Keevan (Christopher Shea). The Vorta, who has run out of ketracel white to feed the Jem’Hadar, manipulates Sisko into killing the Jem’Hadar — who know they’re walking into a trap but accept it as part of blind loyalty to the Dominion. Kevan surrenders himself afterward and provides a transmitter our heroes can likely repair and use to escape. Avery Brooks in the moment when he demanded at least one totally superfluous and unnecessary chance to sing in an episode before the series ended. The events on the planet, while compelling, really aren’t that tapestry worthy. They show how bad and ugly the war is and can get, but we saw a lot of that in “A Time to Stand”. Events on the station are more important, as Kira’s decision to oppose the Dominion — despite Sisko’s advice in “Call to Arms” — is a key domino going forward. There’s some goofiness with the resistance, as noted below. But the decision to create a resistance cell is significant. 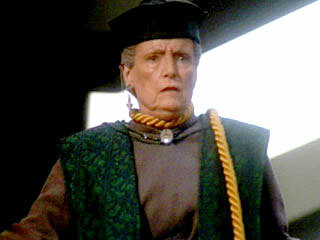 Random vedek, one of like three Bajorans other than Kira and Kai Winn to get a speaking role in DS9’s final two seasons. The big conceit, of course, is that Sisko’s crew would just happen to crash on an uncharted world so close to a Dominion team that did the same thing. Keep in mind that the Jem’Hadar seen here aren’t the ones who were chasing Sisko to start the episode. This was totally random — which is hard to swallow. After Kira forms her resistance cell, it’s made up of Odo, Rom, Leeta and Jake (and Quark, to a point). It makes sense that all of them would be involved — but where the hell are the other Bajorans? It’s just inexplicable that none of the other adult Bajorans on the station — all of whom would have remembered the first Cardassian occupation, which was going on six years prior to this episode — would have opposed a new Cardassian occupation, even if it was kinder and gentler and even if their government was OK with it. By this point in DS9, Bajorans other than Kira, Leeta (sort of) and (later) Kai Winn essentially become red shirts. It’s really a shame, because so much time was used (mostly successfully) early in the series establishing the species. This is probably as down and dirty as DS9 got with actual combat episodes, other than “The Siege of AR-558” in the seventh season. It might be Avery Brooks’ best showing as Sisko, as he really does a great job conveying Sisko’s struggle with a very difficult decision. Brooks was probably the most inconsistent actor who played a captain in Star Trek, but he also achieved some of the highest highs, as he did here. For a low, watch his breakdown in the totally overrated “Far Beyond the Stars” or his over-the-top performance in “For the Uniform”. Nana Visitor also excels in this episode, and the two shots of her looking in the mirror are quite effective. It’s believable that Kira would have adhered to Sisko’s advice up until this point and that she would break with it. Visitor, one of Trek’s most underrated actors, nails it as Kira in this one. Oh, and faithful readers might wonder if we’re planning to review the entire DS9 war arc that starts the sixth season. The answer, after much thought, is yes. DS9 gets into more episodic fair again soon, but these six episodes are all very significant. Worf continues his work as the galaxy’s worst father.